Compensate for incorrect camera settings or different time zones within seconds across an entire folder of images. Adjust images based on camera date time, file created or modified dates or from text in the filename. Quickly and easily select the required images by either selecting a folder or individual images. 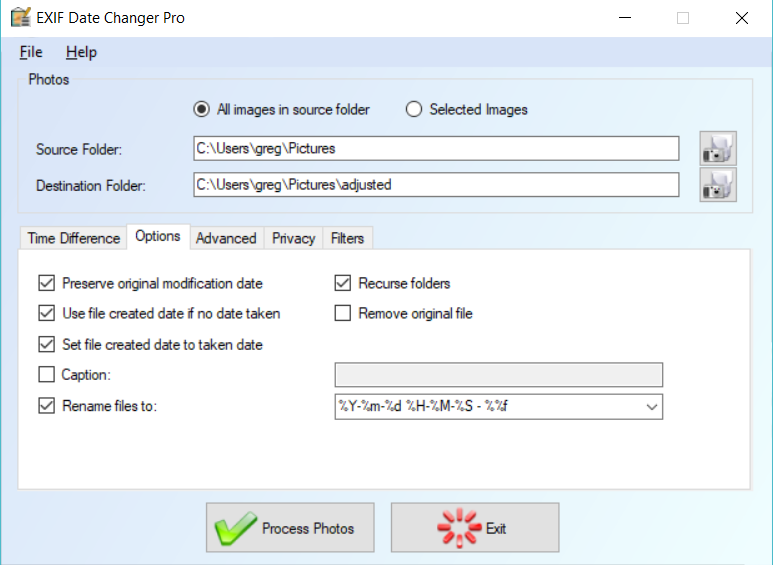 Alternatively set the selected images by using Windows drag and drop to drop a folder or selected images directly onto EXIF Date Changer. Include captions or titles (used by many programs such as Picasa, Adobe Lightroom), keywords, copyright and photo credit information to your images. 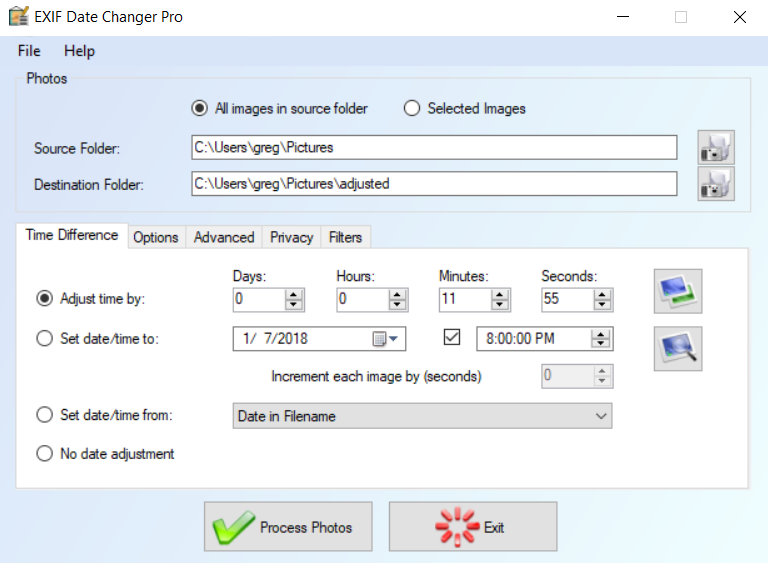 Renaming all the images to include the date time taken within the filename makes it much easier to identify the image date without having to open the image properties, along with easier sorting on devices which don’t allow you to sort by image date time taken. Add time taken to images without EXIF data. Eg. scanned photos, edited photos or photos taken on older cameras. Adding photo dates allows allows photo gallery software and windows to order or find your images by the date the photo was taken. Set a starting photo to a specific date and then add additional time to each subsequent image. 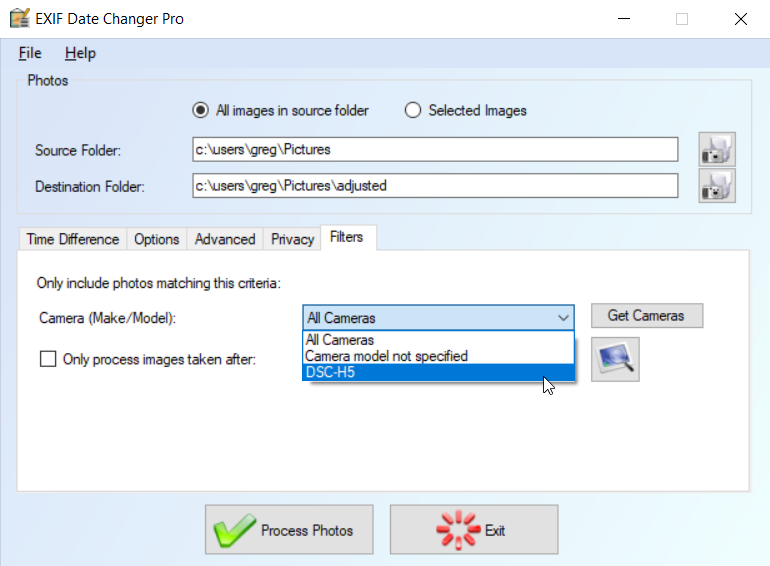 How can EXIF Date Changer help me? Almost all digital cameras record and store various camera settings, scene information, date/time the photo was taken etc as Exchangeable Image File Format (EXIF) data. This metadata is stored within the image file and won’t get lost or overwritten when copying or transferring your photos to other computers. This information can be really useful when it comes to sorting or viewing your digital photos in any photo gallery. Windows, Facebook, Google Photos etc all use this information to sort and categorize your photos. Forgotten to update the date / time while traveling? Want to post a photo but don’t want to give away your location? Many photos now include GPS co-ordinates. Don’t get caught out sharing a photo along with location information which you wanted to keep private. Prefer the date within the filename? Not all software sorts by the image EXIF metadata so batch rename all your photos to also incude the date taken. eg. 2018-07-21 – Hawaii sunset.jpg This is especially useful when using Windows Explorer to sort or manage your photos. Replaced the battery only to later find out your dates are completely wrong? The time information will still be there but will be offset by a fixed amount of time. These can be corrected by adjusting the time by the correct number of days / hours / minutes and seconds. Taken photos with multiple cameras only to discover the times are out of sync? Identify the difference using photos taken from a similar time and then adjust one or both of the cameras photos so that your photos date and times are aligned. Scanned your old images and want to add the photo dates? Adding date times to your scanned images allows photo gallery software and windows to order or find your files by the date the photo was taken. Using filters allows you to separate out and exclude certain images from processing. Adjust images from a specific camera only to synchronize photos from multiple cameras, or only adjust photos taken after a certain date. Time difference calculator to help determine correct date / time adjustments. Enter two different dates to calculate the exact offset difference, or set these dates based off the date time an image was taken. English, German, French, Russian and Polish. Program Updates Access to new versions. Standard Features Set image date/time, caption, file renaming etc. Batch processing of JPEG Image Formats Ability to process multiple JPG images. Advanced Features Setting of copyright, credits, watermarking, image camera filtering etc. Privacy Features Remove all EXIF metadata, camera make/model or GPS location information. We’re excited to announce the official launch of our brand new and refreshed website. This latest version improves support for Windows 10. Need some help? or just want to give us some feedback? Whether you have some problems with EXIF Date Changer or just want to give us some feedback, we’d love to hear from you.